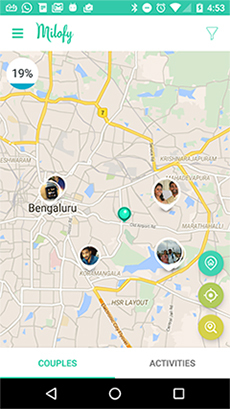 Couple socialising app Milofy, run by Bangalore-based Futuron Systems Pvt. Ltd, has raised $740,000 (Rs5 crore) in seed funding from investment firm Accel Partners, according to two persons familiar with the development. The investment marks Accel Patners' first investment in a social networking app in the country and was completed in January. Milofy was founded in December 2015 by Arshya Lakshman, a graduate of University of Strathclyde, who had earlier worked with Kalaari Capital. The app aims to organise socialising activities such as outdoor sports, theatre, creative classes, etc., for like-minded couples. Milofy is operational only in New York at present and competes with many apps in the international market, such as Avocado, Pair, Cupple, and Duet, which solely focus on couples. While most dating apps work by providing better communication tools (such as privacy, messengers. voicemails, etc), Milofy differs as it aims to connect couples with other couples in the vicinity for social get-togethers. Emails sent to the company and its investor did not elicit any response at the time of filing this report. According to filings made with Registrar of Companies (RoC), the investment was made through Accel India IV Fund, a $305 million (Rs 1,900 crore) fund raised in April 2015. From the fourth fund, Accel has made investments in firms such as rewards platform Crownit, budget accommodation firm FabHotels, furniture rental platform Rentomojo, among others. While Accel Partners is known for backing market leaders such as Flipkart, Ola and Myntra, it is also incubating companies through its startup incubating platform called Accel Startup Pad. The startups incubated include companies such as Parentlane, a social networking app for parents. In other investment, in June, Accel had backed Bangalore-based Bombinate Technologies Pvt. Ltd, which runs voice messaging service Oktalk, along with Blume Ventures, NuVentures, and TaxiForSure founder Aprameya Radhakrishnan. "I tend to be sceptical of niche social networks, as most of the desired functions can be achieved on the present top social media. But if you discover an underserved though large segment of people, and can build critical mass, it's possible to be the next big thing," said Ajeet Khurana, angel investor and former chief executive of SINE (IIT Bombay's incubator), on the potential networking platforms with a targeted audience. In India, a few other startups that are focussed on interests-based social networking have raised funding in recent months. These include Brigge, which raised seed funding from The Chennai Angels Network in September last year. Another such startup is Affimity, a Bengaluru- and San Francisco-based social networking platform that connects users based on their interests, raised $1.2 million (around Rs 8 crore) in an angel round of funding from Silicon Valley investors and its founders earlier this month.